Let us analyse the mysterious 'kakushi tsuki', or hidden punch, of Wansu kata. It is unique to Wansu; a part of the main sequence of this kata. In Matsubayashi-ryu, the punch is done by putting the fist behind your back (!!) and punching from this position, I kid you not. In Shotokan, at this place in Wansu(Empi), they do 'age tsuki'; which is a straight punch that in some strange sense 'lifts' from the hip - which is even more stupid. Nobody punches like that in a fight. What does this technique mean? Why would anybody put such a stupid striking technique in the main sequence Wansu? Let us analyse the punch from the viewpoint of mechanics. 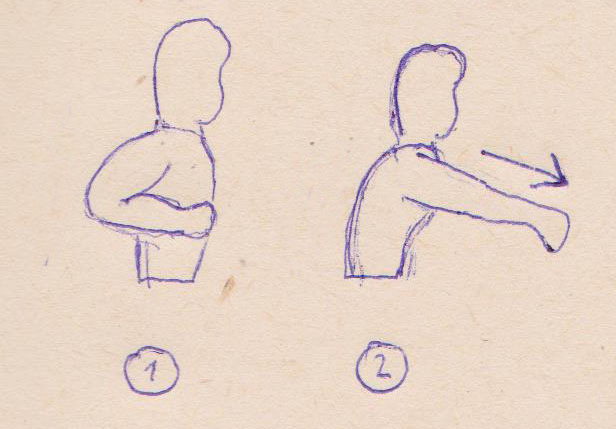 A classic karate punch starts with the scapula down and backward (pos A) - hikite. 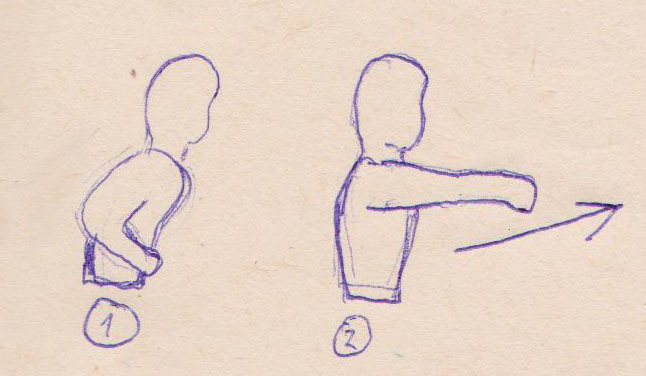 Then it thrusts forward, as the scapula moves forward and up (pos B). The body goes from 'straight' to 'round'. The punch strikes downward. However, kakushi tsuki starts with the fist 'behind the back'. This position forces the scapula naturally forward and up (pos B)! That means if you used classic punching motion from here (to pos B), the scapula would have nowhere to go. On the contrary, the scapula in kakushi tsuki moves from this pos B to pos A - its motion is exactly reversed than in the normal punch! The body goes from 'round' to 'straight'. The punch goes upward. The 'fist behind the back' is not really what's important; this inverted bodywork is important. 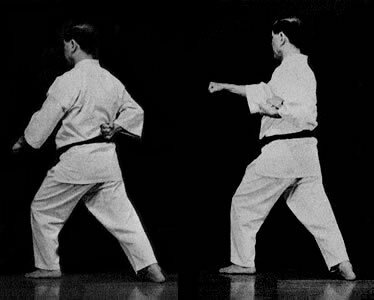 Now, even age-tsuki of shotokan makes sense, as it is based on this reversed movement. Therefore, it is obvious that the essence of kakushi tsuki - of this technique of Wansu - is the inverted motion of the torso. This is remarkable. We have to ask - why is this in Wansu? There must be a sufficient reason. 'From nothing, only nothing comes'. What does that mean? First, it could mean that Wansu kata comes from White Crane. However, that does not explain it; even if Wansu is from White Crane, and thus all punches were originally done like this - why were other punches in Wansu changed to standard karate fare, and only this one was kept intact? There must be a reason why kakushi-tsuki, the inverted punch, was kept in the main sequence of Wansu; so strictly it even influenced Shotokan version (in the form of 'age tsuki')! If I ever get to publishing my analysis of Wansu kata, I will explain how this fits in the general scheme of the kata.